Edgy photo ... 'cause that's how I roll. 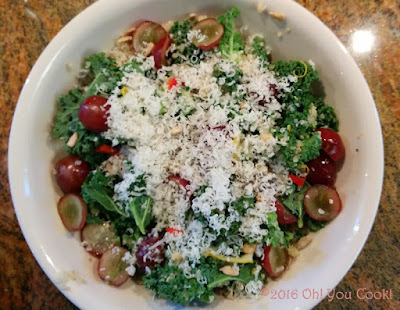 My assignment for this month's Crazy Cooking Challenge was to find a smoothie recipe from another blog, make and post about it. Blueberries are suddenly in season (at least at the local Try-n-Save), so I went a-googlin' for a smoothie of the blueberry persuasion. Fun facts! According to the US Highbush Blueberry Council, blueberries are a rich source of vitamin C and antioxidants, two things I hope will help get rid of a cold I'm currently fighting. Anyway, lucky for you, Dear Reader, I happened upon Love at First Bite. 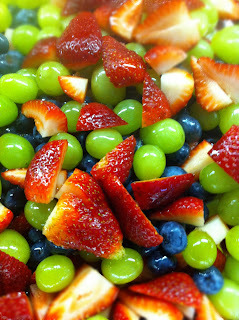 Missy's blog has many healthy and delicious-looking recipes. She has published a book with photos as awesome as the recipes. I'm going to have to take some more time later and really dive into her recipes. But right now one particular recipe on her blog is just right for the CCC ... her Blueberry, Banana and Coconut Smoothie. I did make a few changes. Since there is more banana than blueberry, I anally felt the need to rearrange the title. I omitted flax seed since I had none. Missy didn't mention if the shredded coconut was sweetened and I do have both sweetened and unsweetened in stock, but decided to use the sweetened variety. And I like my smoothies thick enough to cut with a knife so I used Greek yogurt. 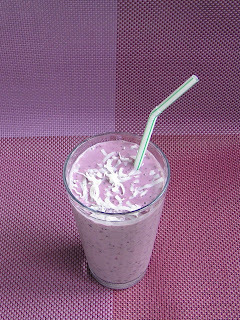 Add the optional milk if you prefer a smoothie less solid or if you intend to share. I don't and I didn't. The blueberries are hiding... they are camera-shy. Place all ingredients in a blender (if you have one) or a food processor (if you don't). Avoid spilling yogurt on the floor ... unless you have a canine cleanup crew. Blend/process until the racket from all those ice cubes grinding has subsided and the smoothie is smooth. Add milk to thin if you only have narrow straws or want to stretch the servings. Pour into 1 tall glass or two polite smaller ones. Top with a teaspoon or so of additional sweetened coconut and pop in a straw. Serve immediately. Cujo says, "Greek yogurt is da bomb!" 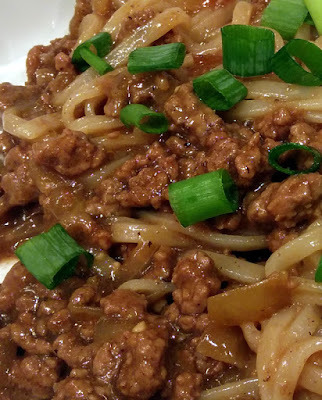 Disclaimer - because this recipe is part of an online cooking group, the linked recipes below might not be kosher. 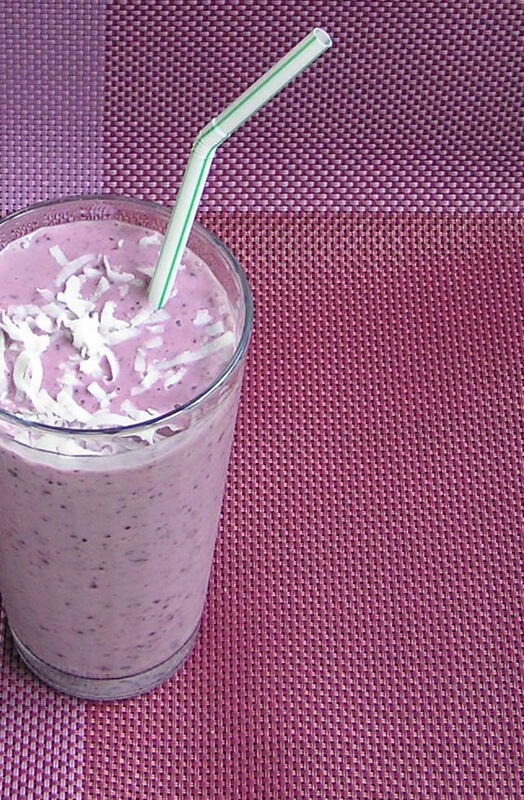 BLueberries and coconut sound delicious together. Good pick! 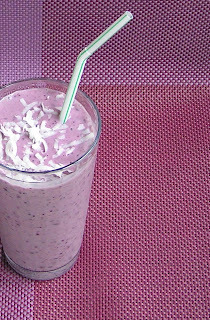 I love the coconut in this smoothie! This is definitely going on my to try pile! I love this---the coconut sounds fantastic! I need to try adding coconut to my smoothies, it sounds delicious. If you haven't already, I'd love for you to check out my CCC entry: Mango Melon Banana & Chia Smoothie. Looks great! I just found out about this Crazy Cooking Challenge today from another blog...sounds like fun & thinking of joining!! You should ... your recipes are delicious! What a great looking smoothie! Sounds wonderful. I love the coconut addition. What a great idea! Sounds delicious! Gail, if you see this, plz resend your email. I somehow managed to delete instead of saving it, and of course yahoo has a nasty habit of permanently deleting only the important one. Sorry! This is a wonderful combination.